For some buildings, putting on the ritz means having a marquee to proclaim power and prestige. Like canopies, marquees signal a buildings entrance but they are less prone to showing grime and suffering the slings and arrows of outrageous winds. They are also more permanent and more expensive. They come in different shapes and sizes, of course, and are important sculptural elements to a buildings architecture. 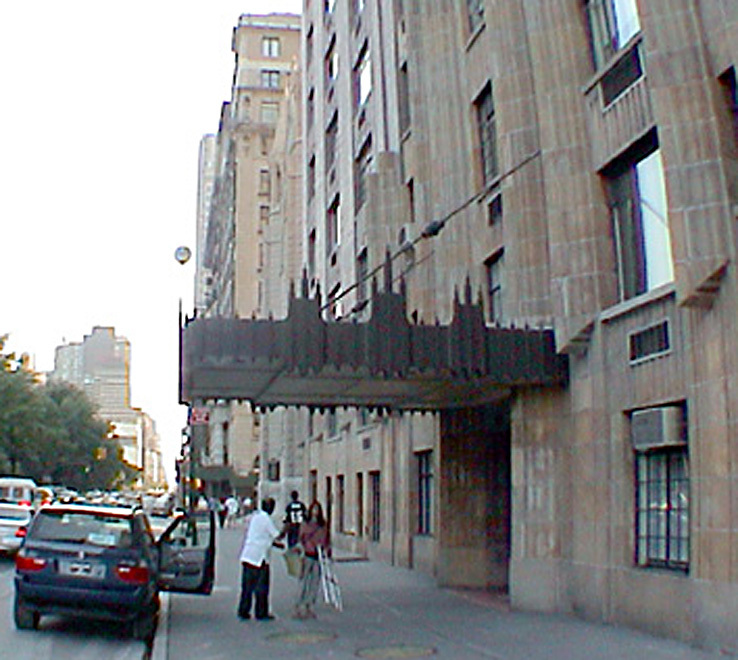 At 55 Central Park West, for example, the large marquee is a bold depiction of the peaked and fluted verticality of the Art Deco building, which was designed by Schwarz and Gross in 1930. A fitting centerpiece for the buildings soaring aesthetic, it abjures the typical horizontal form and celebrates and reinforces the buildings design motif. 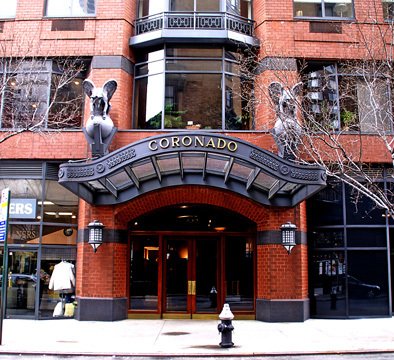 Not far away from 55 Central Park West, the Coronado at 151 West 70th Street has a large, curved marquee topped with two large, but not terribly fierce, dragons, a rare modern excursion into the macabre world of gargoyles and gremlins. While the marquee at 55 Central Park West is a strong aesthetic statement, the Coronados is pure whimsy. The dragons highly visible perch makes Broadway boulevardiers do double-takes. Humor is extremely difficult in architecture, but Schuman, Lichtenstein, Claman & Efron, the architects of the Coronado, have managed to bring it off quite well here even if the sculptures will win no stonemason awards from Medieval guilds. The condominium building was developed by Sherwood Equities and opened in 1990. 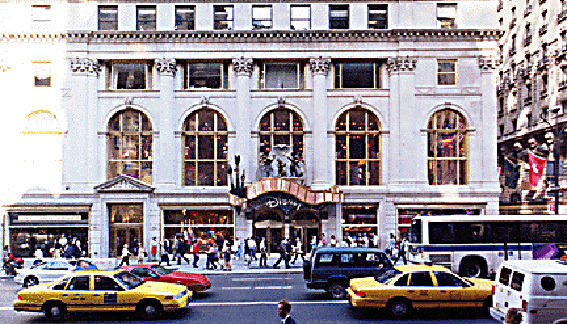 The citys most impressive marquee is at the Fifth Avenue entrance to the Plaza Hotel, which was designed by Henry J. Hardenbergh. It has recently been restored in preparation for the buildings reopening and with its leaded glass and gilded ornamentation it reeks of opulence and black-tie celebrations. The Central Park South façade of the Plaza has another large marquee and three smaller ones, all properly ornately braced by fancy brackets. 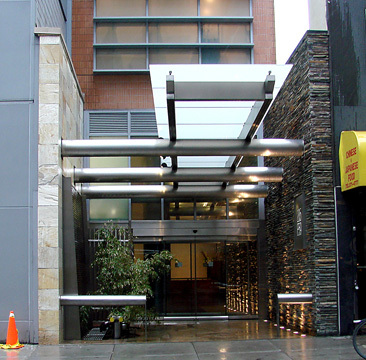 The apartment building at 205 East 59th Street has a narrow side-street entrance with a glass marquee supported by enormous shiny steel pipes that probably inspire its residents and visitors to dream of jungle-gyms. The building was designed by Richard Dattner for the Zucker Organization and completed in 2005. The Porter House at 366 West 15th Street, SHoP Architects designed in 2002 for Jeffery Brown a large shed marquee that surrounds the entire base of the building recalling the large sheds on many nearby meat-packing buildings. The front edge of the marquee is illuminated, which relates to the very dramatic lighting of the buildings top addition. While every building does not need comic-book characters cavorting above its entrance like at the Disney Store on Fifth Avenue at 55th Street, clearly marquees can set the stage for many flights of fancy.